Being long-lived and regarded as the eldest brother of Vietnamese contemporary fine arts, Nguyen Phan Chanh was the epitome of an artist selecting his own career path. His artworks which were imbued with national soul made valuable contributions to the collection of humanity. In 1929, when studying at the Indochina Fine Arts College, Nguyen Phan Chanh took part in the competition for painting stamps of Indochina Postage Stamps. His painting depicting a farmer growing rice won the first prize. He received a large sum of money – 90 Indochina cents. At that time, this amount of money could buy more than 3 tons of rice. After the exhibition in Paris in 1931, Nguyen Phan Chanh’s silk paintings became almost “branded” among Western ones. His paintings which were not finished yet were ordered with high prices. They brought him happiness, pride even. However, Nguyen Phan Chanh supposed that everything was not always what it seemed; it entirely depended on his grittiness and great refinement. 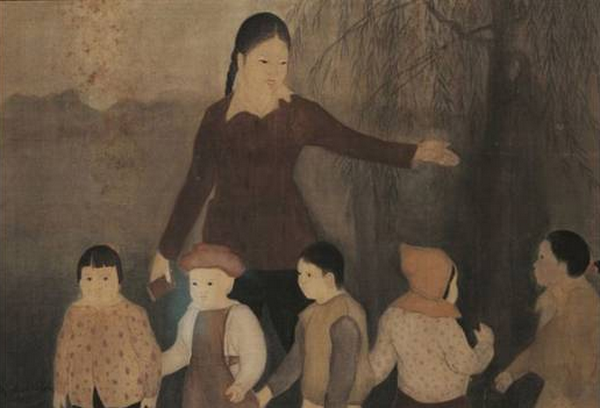 According to the writer Nguyet Tu, when Nguyen Phan Chanh was 12 – 13 years old, one time he determined not to sell a painting as he wanted to hang it on Tet holiday that would please his mother and his siblings. Later, when teaching at Buoi school, he flatly refused to sell the painting “Two sisters” to the French General supervisor because that painting was ordered and he had to maintain his prestige. Nguyen Phan Chanh suggested another painting to the General supervisor but he disagreed and asked Nguyen Phan Chanh to redo the painting “Two sisters”. Nguyen Phan Chanh firmly said: “I am a painter, not a photographer”. Therefore, he was dismissed from Buoi school afterwards. During his lifetime, although many Western people asked Nguyen Phan Chanh to sell his paintings for high prices, he only sold his paintings for Vietnam Fine Arts Museum though they were fetched low prices, just cost three times as much as the frames. When he studied at the Indochina Fine Arts College, Nguyen Phan Chanh did oil paintings like other students. Principal Victor Tardieu did not appreciate his capacity for oil painting. Nonetheless, Victor Tardieu advised him to work on silk paintings due to his remarkable ability to write Chinese by paintbrushes. Afterwards, his outstanding talent for silk painting made a strong impression on Victor Tardieu. Art-lovers usually felt a sense of relief throughout the smoothness of his masterpieces’ material and the elegance of their color. Not everyone knew that Nguyen Phan Chanh had to build the layout very carefully to sublimate his artworks. 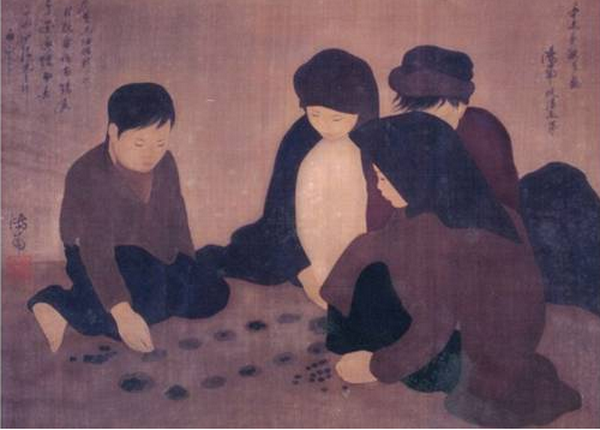 As regards the paintings “The child feeding a bird” (1931), Nguyen Phan Chanh also focused on the layout. He said that “I emphasize on the birdcage rather than the bird. Although a part of the bird is hidden, people still realize that it is a nightingale in the cage. 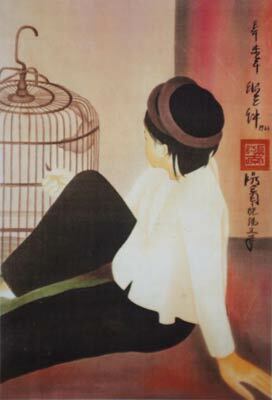 The girl who feeds the bird and wears a white shirt and black trousers is front of the bird but people will take notice of the bird jumping in the cage first and then they pay attention to the girl.” According to the news, during his lifetime, Nguyen Phan Chanh was keen on birdsong. He composed many poems about nightingales and had a notebook to record the birdsong. 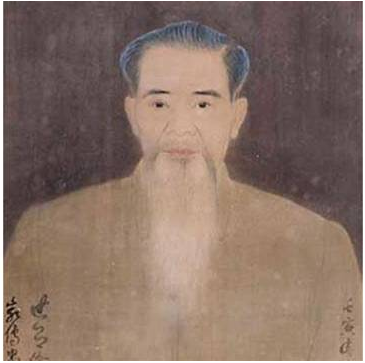 Nguyen Phan Chanh had a unique habit compared to other painters. Although he finished a painting, he had to add several lines of poetry (in Chinese) to convey his feelings. The poems could express the paintings’ content, but sometimes they were just his personal feelings without any relations to the painting. 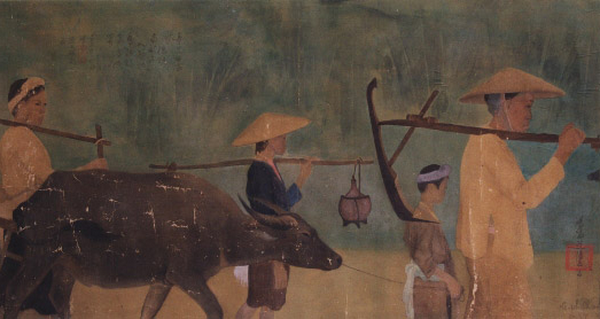 It could be said that the poems on Nguyen Phan Chanh’ silk paintings drew a distinction compared to other paintings. Thanks to this, his paintings were less likely to be copied (because if anyone took notice of the lines of poetry, they would realize his handwriting).